Over the last five years, the Western Balkans has gone from a region synonymous with political instability to one of the planet’s most sought-after travel destinations. At the center of this swath of land in Southeastern Europe, Serbia often gets lost among coastal neighbors like Croatia, Bosnia and Herzegovina, Montenegro, Albania and Greece. However, the hills and mountains here hold some of continent’s most beautiful and wildest places. Locales like Tara National Park and the Danube River (the continent’s second longest). As well, these natural wonders are often infused with centuries-old culture and sites like ancient monasteries and villages. From ancient fortresses to floating nightclubs, Serbia has something for everyone. Here are a few of ideas from Panacomp tourism operator for the next time you’re feeling like being the first of your friends to experience this hidden European getaway, filled with beautiful mountain views and an authentic cultural experience. Some of Serbia’s most hidden (in this case, literally) gems hold the most history. Named after a military commander of the first Serbian uprising, the modern history of the Hadzi-Prodan Cave dates back to 1814 when soldiers and rebels used it to hide from Turkish enemies. This spot is home to 25 extremely rare insect species and is easy to find, as the entrance is tucked directly behind Adzijina Church. You’ll enter through an opening about 10 feet wide and explore this cave that sits at an almost 2,000-foot altitude. If you’re craving an open, scenic adventure, it doesn’t get better than cycling from Zlatibor to Zlatar Mountain. The narrow, rugged path offers a unique view of the Zlatar Lake and Uvac Gorge, which is considered to be one of the world’s most beautiful canyons. It’s hard to get these views of Serbian wilderness from a car; however, if you’re new to cycling, this rocky terrain might be a bit intense. A calmer, slower journey can be taken through the Fruška Gora National Park on horseback. Since Serbia is among the biggest plum exporters in the world, it’s not surprising that the country’s national drink is rakija, a fruit brandy. This spirit can be made with pretty much any fruit (including apricot, peach, and grape) and can be found homemade in most households. The traditional Balkan drink is said to have medicinal uses too, like disinfecting wounds and relieving drinkers of stomach pains. If you’re a wine lover, the Bajilo Wine Cellar in Sremski Karlovci is the place to go. The Bajilo family has been making wine for hundreds of years, dating back to the Austro-Hungarian Empire. The family was one of three in the entire empire that had the secret recipe for a highly-valued spiced wine called Bermet, which can still be enjoyed here, along with a tour and history lesson from a family member. For a more party-like atmosphere, head over to the country’s largest city, Belgrade. The city is notorious for its club scene and has been dubbed the world’s nightlife capital. There are over 30 different clubs here throughout the year, which transform with the seasons; during the winter (September-May), the clubs are indoor, while in the summer, the scene moves to floating riverbank barges called splavs. Serbia’s rich history allows it to have some of the oldest and most beautiful religious buildings anywhere. If you do decide to take a horseback ride through Fruška Gora National Park, make sure to stop at the Rakovac Monastery on the northern slopes. Dating back to 1498, the high ceilings and colorful walls were erected as part of renovations in the early 1950’s, due to damage from World War II. Some of the highlights of the marble-floored church include a bright room covered in paintings of saints and a holy cupola bearing a painting of Jesus and his disciples. Just under an hour drive from Belgrade, you’ll find another historically rich monastery in Topola, a town of less than 5,000. The Saint George Church, also known as the Oplenac Mausoleum (pictured above), is the resting place of the Karadjordjevic family, who ruled Serbia between the fall of the Ottoman Empire and the rise of communist power. The exterior of the elaborate monastery is covered in white marble from the nearby Vencac Mountain and the interior boasts a mosaic made up of 40 million glass tiles stretching over five domes. Trust us, you don’t wanna miss this place. No matter how much you know about Serbia, there’s a good chance you know about one of its most famous sons: Nikola Tesla. A college dropout, Tesla was the real OG behind the idea of “AC/DC” and his legacy has gained a huge hipster following in the past 20 or so years. If you aren’t a fan already, you will be after visiting the Nikola Tesla Museum in Belgrade, which is the largest in the world. Thanks to Tesla’s nephew, the museum holds replicas of his incredible inventions and Tesla’s own ashes (in an urn, of course). For a history lesson in traditional Serbian culture, take a day trip to Terzica Avlija, a park and museum located in Zlakusa Village. The village was a Turkish caravan station in a past life and features fields of raspberry orchards, as well as traditional houses, cuisine and folklore performances. Another important landmark is Novi Sad’s Petrovaradin Fortress, which sits on an original settlement that archaeologists claim dates back to the Early Stone Age. The fortress is home to galleries, restaurants, a hotel, and an art academy, but most notably, is the venue of Serbia’s largest music festival, Exit, held each July. 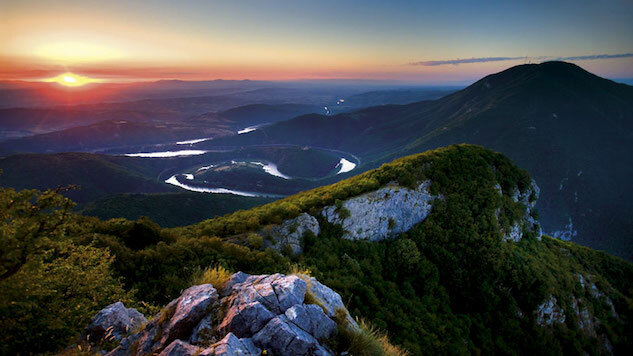 If there’s one thing that Serbia isn’t short on, it’s incredible mountain views. One of the country’s most popular sites is Tara National Forest, which boasts the bright, cyan-colored waters of Lake Perucac (pictured above) and mountainous villages where top quality meat, milk, and cheese are produced. Kayak the lake during the summer or simply take the hike to see these breathtaking views. You might recognize Tara from movies, like the recent film, The Forest. If you’re looking for something more than just a view, Kopaonik Mountain is for you. Kopaonik features fields of wild mint, strawberries, and blackberries, just to name a few. Researchers say that plants found here can be beneficial for skin and heart problems, as well as gastrointestinal ailments. Visitors are welcome to make their own jelly and take home local honey or herbs. Sarah Bennett is a freelance journalist based in Athens, Georgia, with a small budget and a big appetite for the world.